A bed size for each pet size! 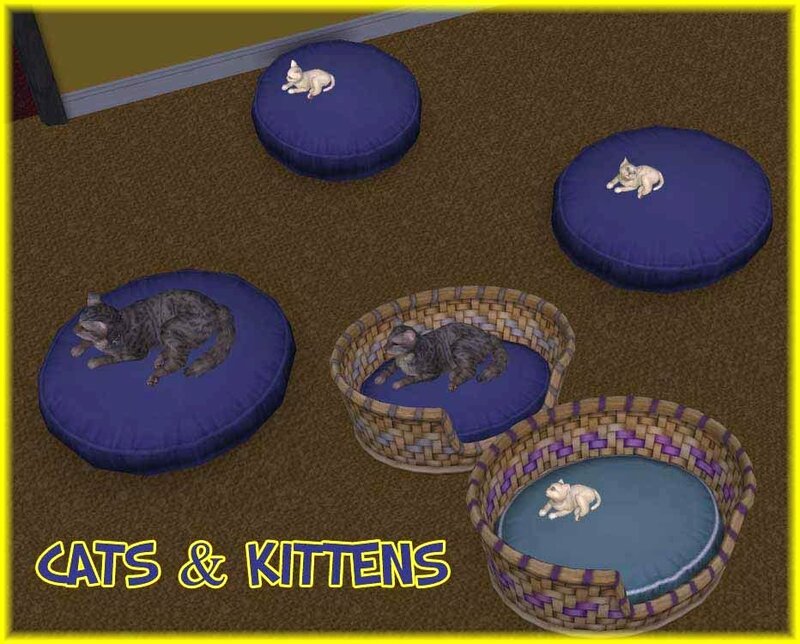 Don't you think that those little puppies and kittens look so lonely when sleeping in the huge Maxis pet beds? Wouldn't you agree that a pet bed created for a large dog should be different than the one used by cats? A Custom Tailored Pet Bed is what you need! Large Pillow for large dogs only. You will find all the above Pet Pillows & Basket in the Buy Mode catalog, subsection Misc/Pets. They all work exactly like the Maxis pillows and baskets, with the only difference that our beds can be used only by selected pets, as explained above. All the pet beds, of course, require the Pets EP; any other EP in addition to Pets is fine. To install the pillows and the basket, extract the packages from the attached RARs and put them in the Downloads folder (or use the Q-Xpress). To uninstall, just remove the packages from the Downloads. The Pet Pillows and the Pet Basket borrow the texture from the Maxis' "The Basket Experience"; so, in order to create a recolour for our pet beds, select from the Object Workshop list (subsection General->Pets) the entry "The Basket Experience" (internal name: "Pet Bed - Basket - Wicker"). For the same reason, all the recolors that you download (or create) for the Maxis basket will automatically apply to all our pet beds, too.